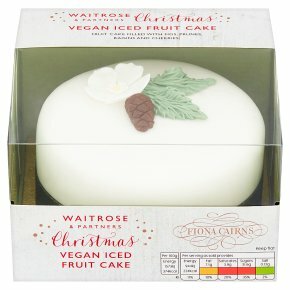 A delicious vegan fruit cake, covered with marzipan and white icing. The cake is then decorated with handmade decorations. Made exclusively for Waitrose in Partnership with Fiona Cairns. INGREDIENTS: sugar, marzipan (sugar, almonds, wheat glucose syrup, water, invert sugar syrup, preservative (potassium sorbate)), date purée, fortified wheat flour (wheat flour, calcium carbonate, iron, niacin, thiamin), coconut oil, glace cherries (cherries, wheat glucose-fructose syrup, sugar, colours (anthocyanins), citric acid, preservative (sulphur dioxide)), figs, prunes, raisins, muscovado sugar, rum, humectant (vegetable glycerine), wheat glucose syrup, nibbed almonds, ground almonds, cornflour, water, wheat glucose-fructose syrup, palm oil, apricot, mixed spices, stabilisers (tragacanth, xanthan gum, cellulose), orange oil, emulsifiers (mono- and diglycerides of fatty acids), flavourings, raising agents (disodium diphosphate, potassium hydrogen carbonate), lemon oil, cinnamon, salt, colours (copper complexes of chlorophyllins, titanium dioxide, iron oxide, curcumin), gelling agent (pectin), acidity regulators (sodium citrates, citric acid), preservative (potassium sorbate), wheat maltodextrin, fat reduced cocoa powder.